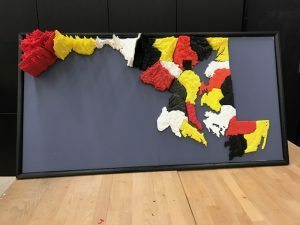 Inspired by the We The Builders project, Casey Kirk from the Maryland State Department of Education reached out to us with a concept for a similar project. She wanted to create a topographical map of Maryland with pieces contributed from students from each county. This project was split into two main parts: logistics and technical pieces. 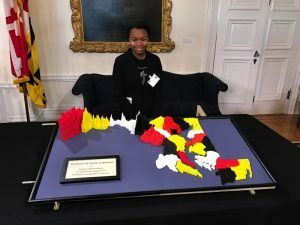 Casey launched into action by contacting schools and youth organizations in Maryland’s 24 counties (including Baltimore City) to find who had 3D printing capabilities. She then compiled a list of contacts and revealed to all the strategy to have each county printed by a different organization. More details developed over time, but the initial plan was relatively simple. Each county would be printed in a specific color and then mailed to DHF for an assembly by youth on Digital Learning Day. Excitedly, the Governor’s office showed interest in the project. A plan was hatched to assemble the project at his office. Casey and Val from MSDE took on the task of handling all of the logistics so that DHF could focus on the technical aspects. 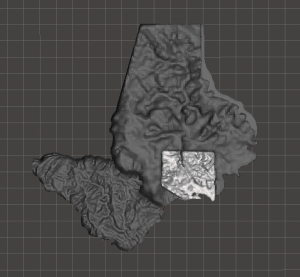 Using Maryland’s Mapping and GIS Data Portal, I was able to get Digital Elevation Models (DEM) of each of the counties. 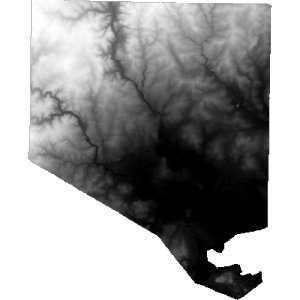 DEMs are grayscaled images where the white sections represent higher areas of elevation, and the darker areas are lower elevations. Once I had a DEM for all of the counties, I then went to work converting them to 3D. I created a spreadsheet to help determine what scale could be used for the map. 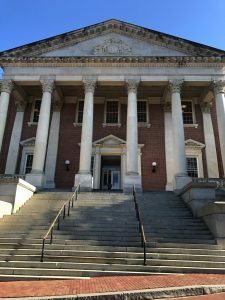 Maryland has everything from beaches to mountains making it a dynamic range of topography. Making it all fit on a reasonably sized map was challenging. It’s not perfect, and I would have tried to use a more universal scale next time, but I ended up using a different proportion for the height than I did for the length/width. 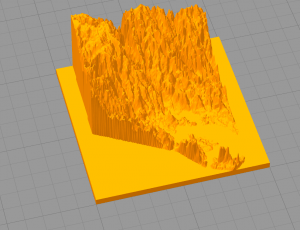 After I had my scale, I started converting the files into 3D. This conversion was made easy by the tool Simplify3D. 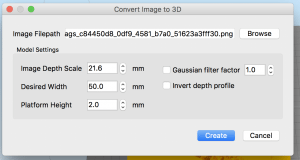 Simplify3D has an add-in specifically meant to convert elevation image maps to 3D. One just needs to load the PNG and set the dimensions of the 3D model. That was a great start. Then I loaded each model into Meshmixer to clean up the edges. After all the files were cleaned up and ready to go, Casey kicked back into action and started to share the data. Initially, we used Google Drive to share the files but then immediately found out a few school districts in Maryland don’t allow teachers to use Google Drive. As an alternative, we switched to using Dropbox to share the files. Everyone now had access to all the county files in case they wanted to print their own version of the map. The project was a lot of fun. Working with Casey and MSDE is something that I love to do. They are extraordinarily innovative and are immensely motivated to bring making to Maryland schools and youth. Being part of a team where we each person contributes a different skill set was great. If I were to do this again, one difference I would make is to form the horizontal and vertical scales a little more similar. The difference between these axes was very noticeable and one of the first things people noticed. The event at the Governor’s office was outstanding. 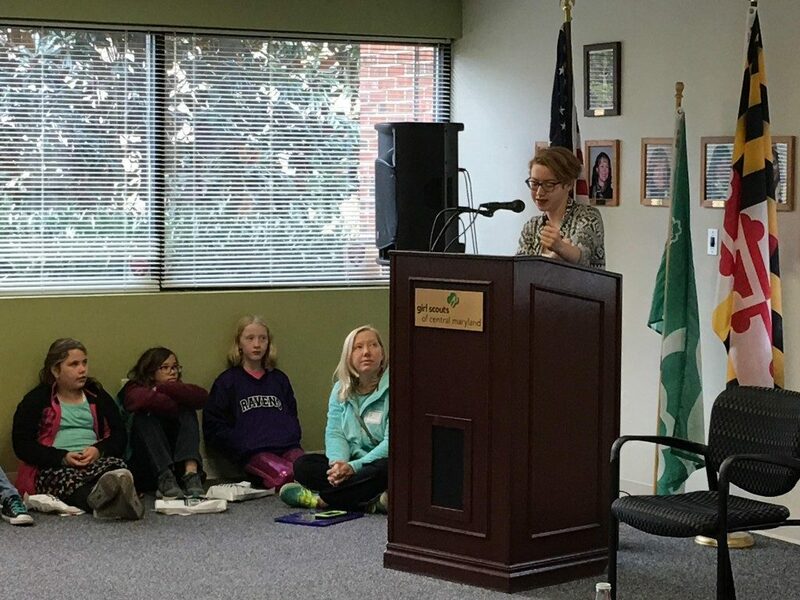 Seeing all of the youth from across the state come together to build the map was inspirational. Traditionally schools have been bounded by physical walls, and a group project meant working only with people in the same room. The Internet has changed this, making our project an exploration of a collaborative strategy that is not limited by physical location. This is also the way that companies in the tech industry act today through tools like Google Docs, GitHub, and Skype. The industries of the future will demand that our students have the ability and agility to do this type of work on a consistent basis. At the Digital Harbor Foundation, we are an agile research and development organization focused on what the future of education will look like and solve tomorrow’s problems today.